A bit of promotional stuff for Doti’s upcoming Sea Monsters range. This one is her take on…The Kraken. Recently I have been filled with desire to work on an old bucket list project of mine, a nicely painted Epic 40,000 force of orks. I intend to play some games with them using the open source NetEpic rules (with some house rules tweaks to it to get rid of the templates as they tend to slow up the game and effectively reduce the available table space). At 24 stands, the Snakebites are the most numerous Clan, with Goffs in 2nd place at 23! Working on some scenic items to build up the battlezone thematically alongside the army would be ideal also. To begin with, I decided that I would work on a Snakebite Clan as I have never in all my time painted a single Snakebite, and now I would paint 105 of them at 6/7mm (Epic scale is in fact a bit wobbly with sizes often dramatically different for infantry models – your average person would probably never notice it anyway). 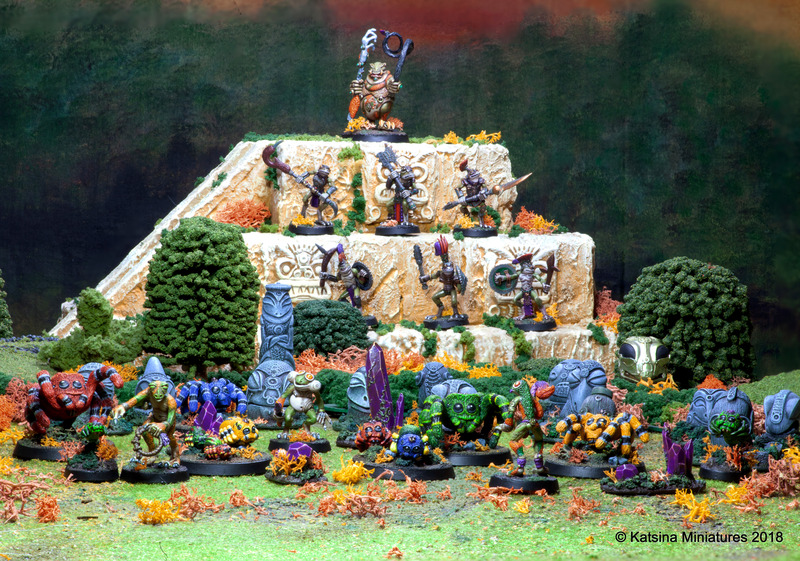 As the Snakebites are supposed to be staunch traditionalists, I wanted them to have a lot of browns, green and metal with a smattering of primary spot colours – like classic fantasy orcs really. The banners were done by carefully cutting out GW Ork transfer sheets to fit. The Nobz got a bit more attention than the boyz. I converted the Epic Ork Warlord to carry a power klaw cut from an Ork dreadnought. In game terms you have 4 identical stands but to my mind the whole Ork Clan should have the Warboss as the focal point, so there he is! 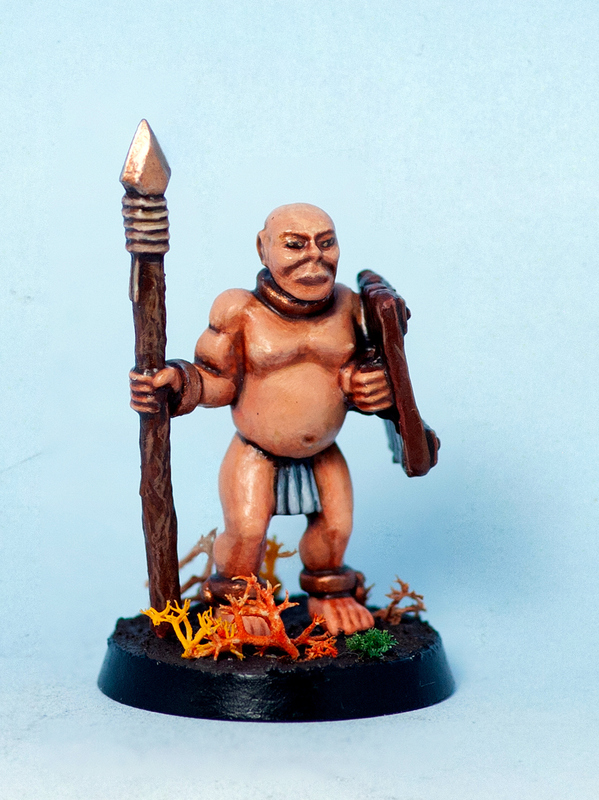 As there are not a huge variety of models available, I decided that I would make my Snakebites unique by sculpting a special Ork to represent them. I did a quick and dirty casting in lead from this – the detail is not quite as crisp as the original but more than adequate to express the idea in miniature. While I was working on him, I started working on an Ork for when I get around to doing the Goff Clan. I think he is adorable so far <3. So that’s a solid 600 points of stuff to begin with. I am looking to add some Squiggoths to this lot and perhaps some Stompas (as they move at about the same speed as the infantry). This is the Sea Elemental from our upcoming “Terrors from the Deep” project. The most excellent old style illustration was done by Mustapha @ Spevna Studio. It is drawn from the perspective of a sailor who has witnesses these monstrosities. Mus has a lovely woodcut feel to his work so we were very pleased to have a project that suited to his talents. The initial design and sculpt was done by Doti. She took the classic Sea Elemental theme and added…seawater vomit. You can easily imagine sailors getting swept off the decks in a torrent of…..GROOOOLLSSSHHHHHCCCCCssssss. Planning to play some 40k soon, and so am in the process of getting the orks into shape. This fellow will act as Warboss for my Hybork heavy force. He has been on the project list since 2016, so great to get him finished ready to play some games with. Conversion of the Black Reach Warboss. Presenting my Slannesh cultists – at least the ones that I have finished anyway. I wanted to do this for a looooong time, so it was great to finally get to them. These are chaos sorcerers with some high tech weapons attached to they can have some fun in the far future. They are super nice guys and naturally they are now wearing their last victims. Fallen Guardsmen with Ex-Imperial Preacher – Kill! Maim! Burn! Before you commit to the life of a cenobite, why not try out the lifestyle in the Cult Militant. See if you have a vocation for sociopathic ultraviolence. 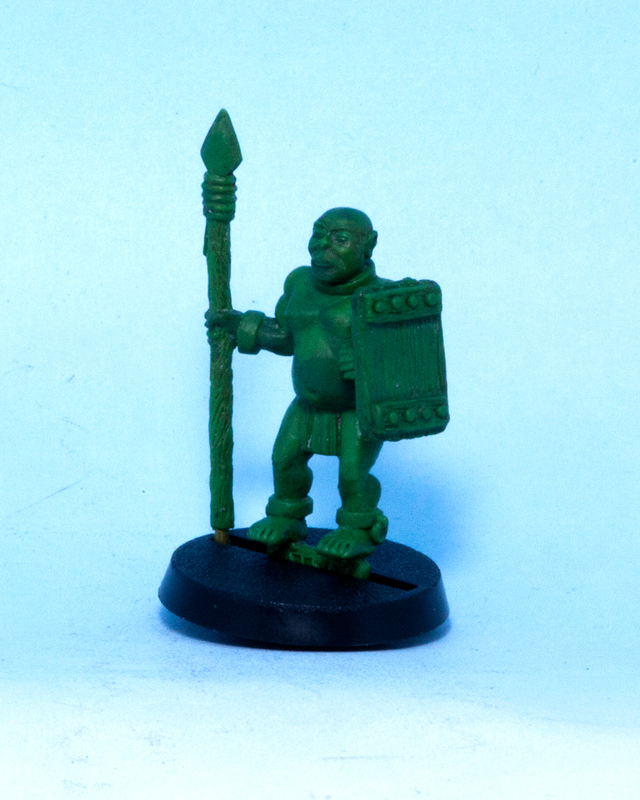 The Classic set of Citadel Slanneshi Daemons are perfect for small skirmish games. I had to do some conversion work on the Greater Daemon, she is really a composite of a couple of greater daemons rather than a stock model. I sculpted the rearmost leg from Green Stuff. This rouge psyker invariably accompanies this warband. 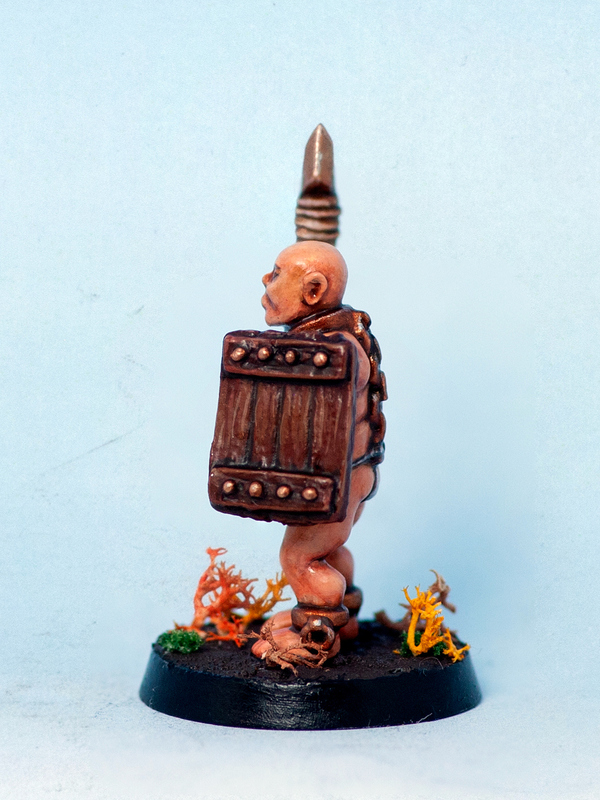 He is a classic armless metal Bratt model from Confrontation. I have used the Soldiers of the Empire set to add the arms. The force rod is simply a halberd cut strategically and carefully filed to flat ends. A home made casting (used Siligum to make a quick drop mould) of this green I made ages ago. This chap is going to have a professionally made mould made for him as part of our Katsina Miniatures Kickstarter that is funding at the moment. All of the Bizaza Kickstarter Models I have painted to date! 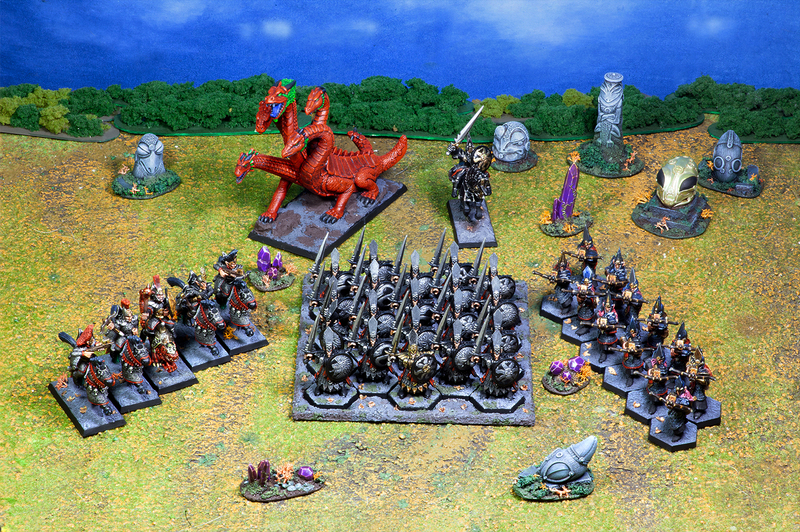 It’s high time I took some pics of the Dark Elf Army Progress. The force has been bolstered with the addition of some repeating crossbows and a Dark Elf Hydra. The Hydra is a Grenadier model (and still available) but as my one had lost it’s tail I sculpted a stubby twin tail to replace it. It will be fun to add some Witch Elves and more cavalry to this lot along with a sorceress to accompany the Witch Elves. The masters for the Frolmec heads Doti sculpted painted up to use as a jungle scatter terrain set. They have simply been mounted on plasticard bases, with some foam card to make a simple step arrangement on a coupe of them. Add texture and then paint. I am happy with the results, they will provide some much needed cover for my upcoming plans to play some of the new Games Workshop Kill Team.